Through several decades of trial and error, we have discovered some marvelous products for dogs as well as some that aren’t very good. While we do not endorse any specific products here, we do highly recommend many of the mail order pet supply catalouges as an alternative to expensive pet store and veternary office prices. We have listed a few of our favorites and some tips on catalouge shopping. We have also found that many new setter owners are a little intimidated by grooming. So we have put together a list of grooming supplies and a few basic tips. There are many pet supply catalogues that offer the same products you find in your local pet store or vet’s office at discounted prices. You can buy virtually everything: heart worm medication (ask your vet for a prescription), vaccines, flea and tick control products, crates, grooming supplies, toys, and countless other items. Like most mail order catalogs, there is generally a minimum order required before you qualify for free shipping (one catalog has no added shipping even on large items such as crates), but if you buy in bulk, have multiple dogs, or combine orders with friends it is easy to get free shipping on your order. It is a good idea to comparison shop between the supply catalogs. Sometimes the same item with be priced differently between catalogs. We encourage all Setter owners to learn to groom. It’s not difficult, and most dogs like the personal attention. You can learn to groom your own dog (we did), just keep practicing and remember your grooming mistakes will grow back. Many breeders and exhibitors are happy to help people learn to groom. 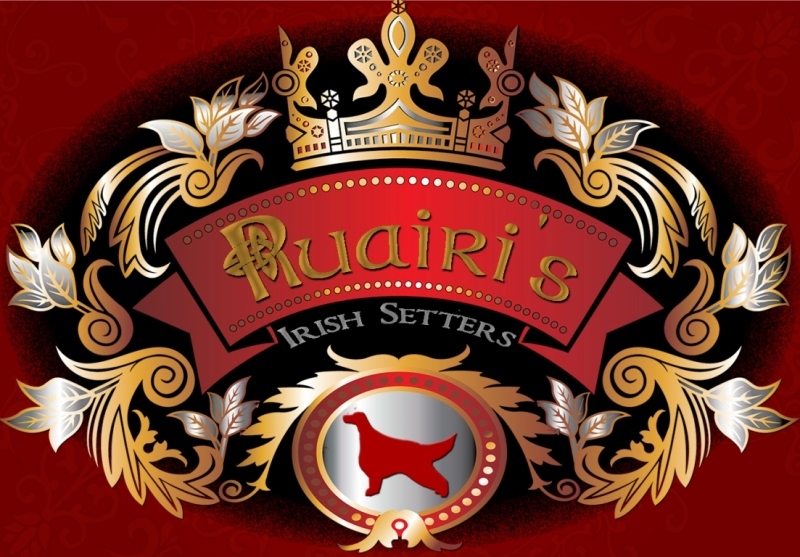 The Irish Setter Club of America has put together a grooming pamphlet and a new grooming DVD. There are also many professional groomers that can perform basic maintenance grooming. In our experience, a grooming shop is not able to groom a setter at the level necessary for the show ring. and a pair of straight shears (5 ½” to 6 ½”) . A grooming table (about 24” x 36”) is a handy option that will save your back. For a finished look (essential for a show groomed Irish) the following items are helpful. If nails are not trimmed, the toes will splay and the feet will become flat. If your dog walks mainly on grass, nails will need to be done weekly. It is a good idea to keep Clotisol on hand in case a nail gets trimmed too close to the quick. Use a natural bristle brush every 2-3 days to brush out the coat. Comb through the coat to take out any knots the brush has missed. Pay special attention to the hair under the elbows as this is frequently a spot that knots tend to build up. Make sure to spray the coat with either Pure Pet grooming spray (1 tsp per 1 pint water) or water before brushing or combing. Brushing a dry coat will cause the hair to break. Use a Mars Coat King (blade size #20) or a stripping knife to strip out dead coat from the back. You would be surprised how much dead hair you can remove (and how much hair will not end up on your floors). Use an Andis clipper to clip around the ears. Always clip with the grain of the hair. Use the clippers to trim the upper third of the ear, and trim the hair on the underside of the ear near the ear canal. This is for hygienic reasons. Clipping keeps air flow around the ear and reduces the chance of ear infections. After clipping make sure to wash both ears and eyes to clear out any small hairs. You can also use the clippers to trim the neck (chin to approximately the breastbone). Use the thinning shears to blend the clipper lines on the neck and to remove excess hair from the backskull and top of the head. Use a straight shears to remove excess fur on the footpads and outline toes. Removing the excess fur from the underside of the foot gives the dog traction and reduces the amount of dirt tracked into the house. You can bathe weekly without drying out the coat. Most people find that once or twice a month is sufficient. We recommend bathing after field running or swimming. Make sure to wash ears immediately after swimming.